Here at Flashbay we help thousands of organisations around the globe with their Branded USB Flash Drive needs. These organisations include photographers, charities, banks, TV networks and of course, Schools and Universities. 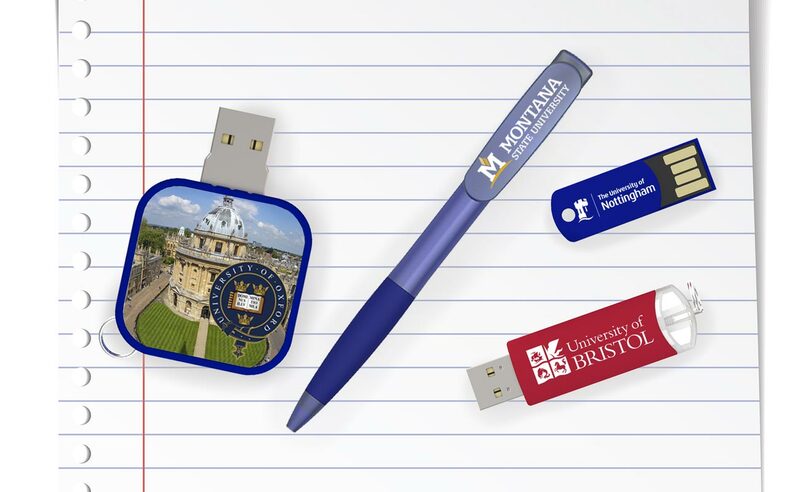 Our latest blog post takes a look at how Branded USB Flash Drives play an important role in the educational community. This week is designed as an introduction to the University or College for new students. During the week the students will be bombarded with material such as Leaflets, T-Shirts, Badges, Stickers and Branded USB Flash Drives. If you ask any student what they actually keep hold of from all of this, it’ll more than likely be the USB Flash Drive. Something that they will continually use throughout the year and beyond. Students have been using laptops in University lectures for some time now. Laptops are also becoming more popular in Primary and High Schools too. Saving your work on your laptop is obviously one way to ensure all of your hard work stays intact but you should always back it up on your USB Flash Drive too. The dreaded ‘laptop virus’ can wipe out an entire semester of work within a few minutes. Sharing course work or notes is a common occurrence in most Universities. Sometimes the notes span several years and can accumulate into quite a large file size, which is often difficult to email. As such, most students opt to save everything on a Flash Drive and share this with their fellow pupils. Remember, we can also preload your Branded Flash Drives with any data of your choosing via our Data Preload service. If you’d like some Branded USB Flash Drives please fill out our Quick Quote Form. One of our dedicated Account Managers will be in touch as soon as possible.